Maybe the reason I keep myself so distracted is because of the way I feel when I actually get a grip on reality. Where would I even start making a difference? What impact can I really make? Why do I have it so much better than the majority of the world? What I do know is that we all need to wake up in a big way. 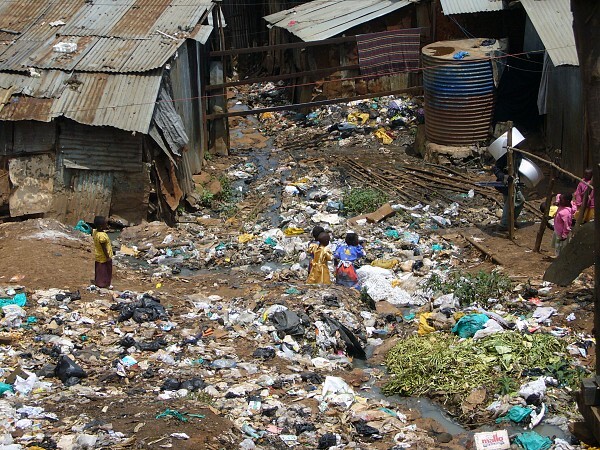 I came across this picture today, this is a slum somewhere in Kenya. Since most of my thoughts are on Africa at this point in time, I am usually googling images of various things going on in Kenya or Uganda. I’m pretty certain my heart and mind caught a flight over there about a month and a half ago- I will be so glad to be reunited with them. I still cannot believe that people actually live this way. People live in this. Sick people muck through all of this trash and waste in order to get to the door of their little tiny shacks while I, in basically perfect health, drive my own adorable car down clean, beautiful streets to my beautiful house where my beautiful family lives with all of our beautiful things. Why is this okay?? I am not treasured by the Lord any more than these little kids are, He may even have a bigger purpose laid out for them than He has for me. How can we look at pictures of things like this and not shed a tear or feel really angry? Like I said, we need a major awakening.